U.S. Rep. Tom O'Halleran, D-Ariz., (middle), listens as President Russell Begaye speaks during a uranium town hall meeting May 30 in Cameron. WINDOW ROCK—President Russell Begaye is applauding the U.S. House of Representatives for its unanimous approval June 7 of an amendment that allocates $1 million from the Department of Energy to expedite the cleanup of abandoned uranium mines on the Navajo Nation. The amendment, introduced by U.S. Rep. Tom O’Halleran, D-Ariz., amends the Energy and Water Development and Related Agencies Appropriations Act to designate funds to the Defense-Related Uranium Mining Program, which oversees the cleanup of more than 4,200 abandoned uranium mines in the United States. The Navajo Nation Washington Office worked closely with Rep. O'Halleran in the development of this amendment. The measure next goes to the Senate for a vote. The amendment is a victory for Navajo, President Begaye said. But the uranium industry and federal government have more work to do. 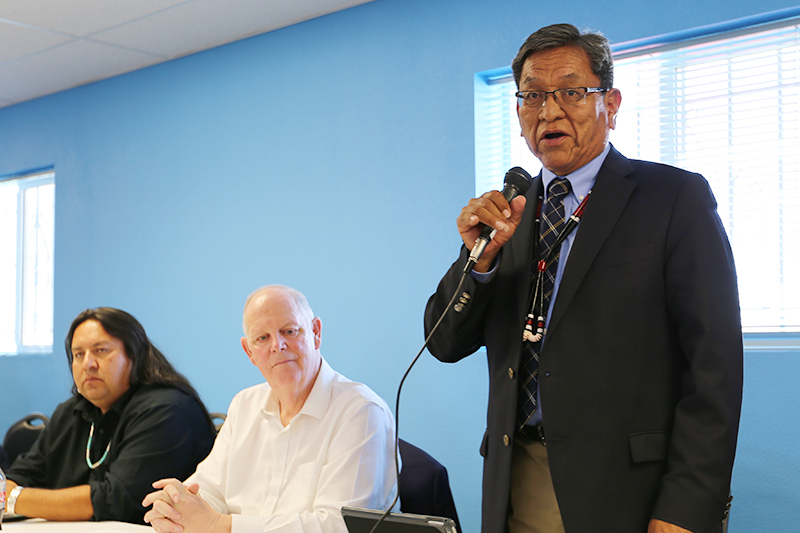 During a May 30 town hall meeting in Cameron hosted by Rep. O’Halleran, President Begaye urged lawmakers to do more to mitigate the effects of uranium on the Navajo Nation—and to prevent future contamination. The town hall, the second of its kind sponsored by Rep. O’Halleran’s office, was held in the Western Agency, where 111 abandoned mine sites are located. There are many others sites located on the Navajo reservation including Ojiato, Sweetwater and Churchrock. Rep. O’Halleran recently introduced H.R. 5128, the Tribal Uranium Exposure Treatment Enhancement Act of 2018, which would give tribes access to USDA funding to build facilities to treat uranium contamination. That funding could help build an oncology center on the Navajo Nation, where cancer is now the second-leading cause of death, President Begaye said. 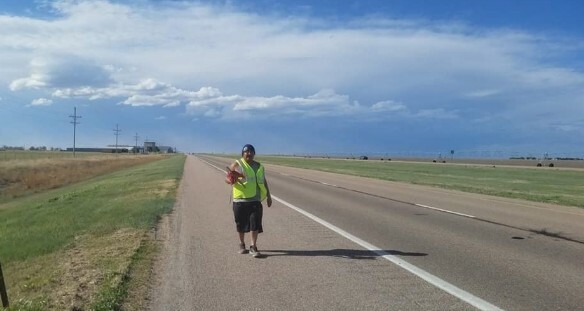 Yet patients have to travel off the reservation—and sometimes hundreds of miles from home—for treatment. During the town hall meeting, President Begaye pointed to the 567 abandoned and unmitigated uranium mines on the Navajo Nation, calling them a “public health crisis that almost no one is talking about.” Despite the legacy of contamination on Navajo lands, uranium companies continue to seek mining permits. The Navajo Nation also opposes the transportation of uranium across Navajo lands—even on federal or state highways, President Begaye said. Companies mining leasing minerals in the Grand Canyon have claimed they can transport uranium across the Navajo Nation if they stay on public roads. In his statement during the town hall meeting, President Begaye voiced support for H.R. 2049 and S. 197, the Radiation Exposure Compensation Act (RECA) amendments of 2017, which would add benefits for people who worked in uranium mines after 1971. The amendments would also expand “downwinder” coverage. Vice President Jonathan Nez also called on Congress to pass laws that more strictly regulate new proposals for extraction while also remediating old sites and compensating people still dealing with the effects of uranium exposure.